Newest generation tablet PC with 10.1" touch display, WIN 7 / Win 8.1 and optional RFID (LF, HF, UHF) for extreme operation IP65. 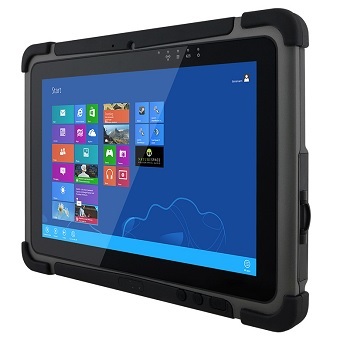 Performance Windows® Embedded 7 / 8.1 Pro Tablet PC 10.1"
The AGX MB101 Tablet PC is a full rugged and powerfully equipped tablet PC. This rugged tablet PC integrated with 10.1” touch screen and a high performance, low power consumption Intel® BayTrail-M Quad-Core 1.8GHz processor. With options for a 1D/2D barcode scanner, HF-RFID, and dual front & rear camera, these rugged tablets offer seamless information capture for immediate transmission. The AGX MB101 is a fan less design and compliant IP65 water and dust proof protection. This robust tablet PC AGX MB101 works up to full 16* hours with one time battery charge. With an outdoor-viewable display integrated with touch screen, the rugged mobile PC AGX MB101 performs efficient outdoor as well. The AGX MB101 offers a blend of performance, integrated features and mobility. Rugged tablet PC AGX MB101 helps every user to work smarter and more effectively. This industrial level tablet AGX MB101 also helps to achieve e-paper for environment protection. Due to all these features and functions the AGX MB101 can satisfy almost every application requirement or mobile need. Data transfer via WLAN, BT or USB is not a problem and with the 3,5G modem it allows full connectivity even in the field. Permanently online processes will improve in the shortest time. The AGX MB101 has an 10.1-inch IPS LED backlight (1920x1200 WUXGA) Touch Display. LED back light and sunlight readable makes it most ergonomic day and night. With a size of 271.8 x 197.2 x 19 mm (10.7 x 7.76 x 0.75 inches) and low weight of 1,2kg (incl. battery pack) it is handy at any moment of time.